November 2, 1861 – The Confederate Government purchases buildings and land for a prison at Salisbury. December 1861 – The first Federal POW’s arrive in Salisbury. October 12, 1864 – December 12, 1864 – In this sixty-day period an average of 22 prisoners died per day (a total of 1,320 deaths). The average prison population during this time was 8,200 prisoners. 16 4/41’s (almost 16.1%) of the prisoners died in two months. For comparison during February 1863, 387 of the 3,884 Confederates held at Camp Douglas near Chicago died. This was a death rate of almost 10% (9.96%) in one month! February 17, 1865 – Inspector General T.W. Hall, CSA, inspects the prison. Hall reports 10,321 prisoners were received from October 5, 1864 until February 17, 1865. During that time 2,918 prisoners died in the hospital. Hall also reports the burial sergeant buried 3,479 prisoners between October 21, 1864 and February 17, 1865. Many prisoners died in quarters. This number is very close to the 3,504 burials reported by Brevet Brig. Gen. J.J. Dana in 1867. February 22, 1865 – The prisoners march out of the prison en route to Union lines. June 13, 1867 – After 57 days of testimony a military tribunal acquits Major John H. Gee, the commander of the prison, of charges of cruelty to prisoners. 1868 – The Quartermaster General publishes Volume 14 of the Roll of Honor series. This volume listed 3,501 names plus 3 unknowns buried at Salisbury. 1868 – The Inspector of National Cemeteries, Brevet Col. C.W. Folsom, reports “9,000 to 10,000 confined” at Salisbury and “5,000 fell victim”. However the printed report also claims that 18 trenches in the cemetery contained “… the bodies of about 12,000 Union Soldiers…”. In 1994 Mark Hughes located Col. Folsom’s original report at the National Archives. Someone in the Quartermaster Department had changed Folsom’s report. Folsom reported 5,000 deaths. The 5,000 was struck out and changed to 12,000. Folsom reported 13 trenches. The 13 was struck out and 18 trenches was inserted. 1869 – The Inspector of National Cemeteries, Brevet Major General L. Thomas, reports: “It is estimated 11,7000″ were interred in the cemetery. Thomas had first inspected the cemetery on October 24, 1867. His second inspection was made on November 1, 1868. Thomas opened two trenches “… to ascertain…” if the bodies were buried in coffins. Most of the bodies were not. Thomas also reported that “Major Gee (the commander of the prison) was tried and acquitted after the war”. 1897 – B.F. Booth, “late of Co. I 22nd Iowa Inf.”, writes about his confinement at Salisbury in Dark Days of the Rebellion. 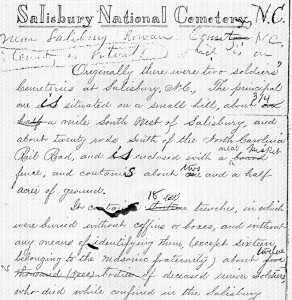 When he was released on Feb. 21, 1865, Booth copied the number of deaths in the burial register. He reported 3,800 deaths from Oct. 6, 1864 from Feb. 21, 1865 (138 days). 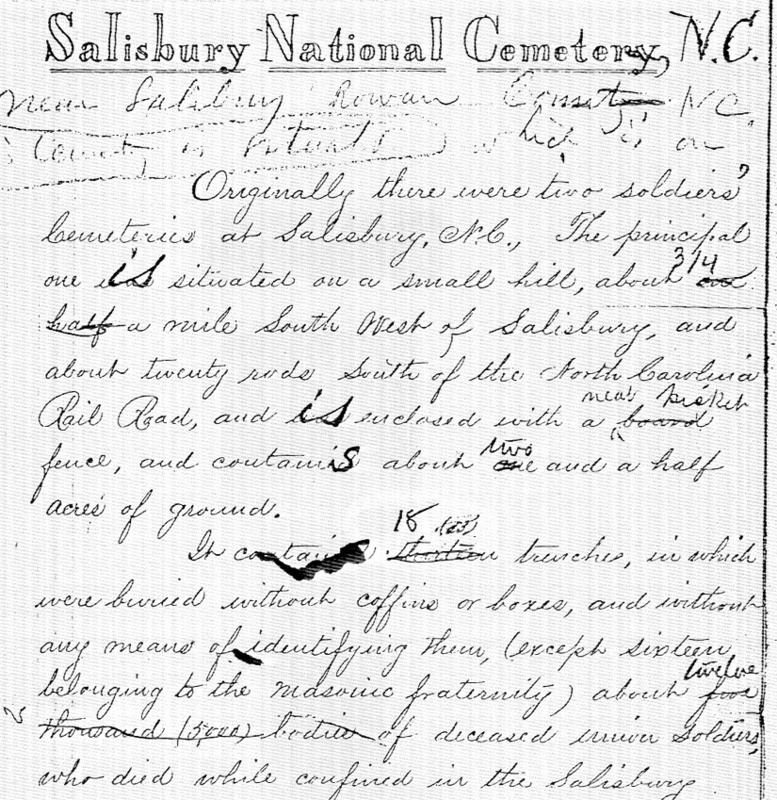 1980 – Louis Brown exposes the truth about the number of burials at Salisbury in The Salisbury Prison: A Case Study of Confederate Military Prisons, 1861-1865.